Bajoran Personnel of Bajoran species. Assassin. Order - Remove a personnel in your discard pile from the game and return this personnel to her owner's hand to kill an opponent's personnel present who has a skill the removed personnel has. "The prohphets spoke. I answered their call." 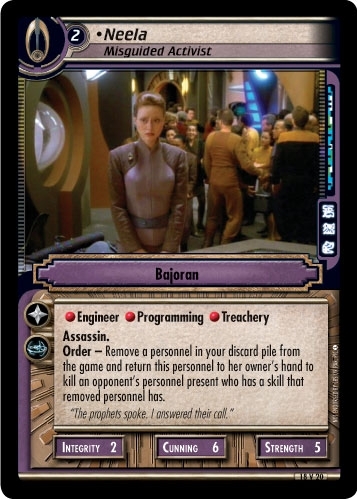 Characteristics: "relocate" personnel cards - return to hand, kill opponent's personnel, affiliation, "use" your discard pile, Deep Space None related, remove cards from the game (other cards), Assassin, Bajoran species.